Marching ducks, bike adventures, ice cream, and more! Memphis is known for blues, BBQ and nightlife, but it’s a surprisingly great getaway for the family. With unique attractions like twice-daily duck marches, quirky stores and museums, a world-renowned zoo, an active riverfront, and parks loaded with hidden gems, you can easily keep all ages entertained for a weekend or longer. 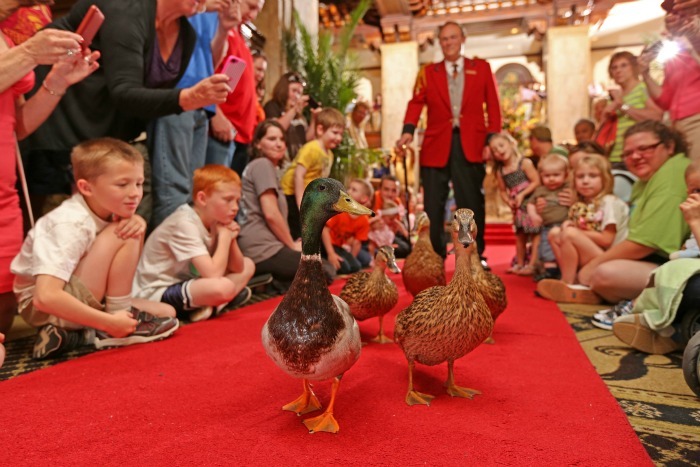 Whether or not you stay at the magnificent four-star, four-diamond Peabody Hotel, a stop to see the Peabody Ducks march to and from the Grand Lobby is a must if you have small children. Every day since 1933, when the hotel’s general manager and a friend thought it would be a great joke to put their live hunting ducks in the Peabody fountain, the adorable birds have marched from the roof into the elevator, which they ride down to the lobby for a dip in the fountain at 11a.m. If you can’t be there in the morning to see them hop into the fountain, then be there at 5p.m. to see the ducks march back to their sleeping quarters on the roof. You’ll probably find yourself in the neighborhood anyway--this downtown hotel is just blocks from Beale Street, the Memphis Rock ‘n’ Soul Museum, Gibson Guitar Factory, FedExForum, National Civil Rights Museum, Sun Studio, Orpheum Theatre, and the Memphis Cook Convention Center. Pickled watermelon rinds or corncob jelly, anyone? You’ll find all kinds of strange and interesting things at A. Schwab, a fixture on Beale Street since 1876. Even though kids might not go for the pickled watermelon rinds, this emporium/museum/ice cream parlor sells all kinds of stuff. Expect to find regional arts and crafts, toys, dry goods, magic potions, candies, books, magazines, funny hats and Memphis souvenirs from places like Sun Studio, Hi Records, Graceland, and Stax. Stacks of merchandise share the store with artifacts of the store’s past and the city’s history, and a turn-of-the century soda fountain serves ice cream and other delights that the young (and young at heart) are sure to enjoy. The Memphis Zoo is consistently rated one of the best in the nation. They’re known for their rare (and incredibly adorable) pandas, and they opened their newest exhibit, the Zambezi River Hippo Camp, in April 2016. The zoo is set within Midtown’s Overton Park, an historic green space with a giant, colorful playground. Don’t miss the whimsical Bike Arch at the pedestrian/bike east entrance, made of a colorful tangle of—you guessed it—bikes in all shapes and sizes. Housed in a pink marble mansion in the center of Memphis’ I-240 loop, The Pink Palace Museum – Sharpe Planetarium is the Mid-South's biggest science and historical museum. Kids will love the dinosaur and fossil exhibits, along with the shrunken head and electric miniature circus carved from wood. The museum also has interesting murals, a walk-through replica of the first self-service grocery store in the country, exhibits on the region’s cultural and natural history, and an extensive exploration of Memphis’ development from the first Spanish explorers to visit the area through the Civil War. The planetarium was remodeled in 2015 to add Full Dome Digital interactive technology, and the CTI 3D Giant Theater was updated in 2014. Shelby Farms Park in East Memphis is the biggest public park in the U.S., with a whopping 4,500 acres of green space. The Woodland Discovery Playground is a must for young children, and the park also has walking, biking, and horseback trails, fishing lakes, live bison and more. Adventurous? Rent bikes and take the Shelby Farms Greenline trail 6.5 miles to Midtown, where you can find Overton Park, the Memphis Zoo, and more. With exhibits like an art studio, fire engines, a stage, a splash pad, a dinosaur dig, and a skyscraper playground (which sounds incredibly fun), the Children’s Museum of Memphis is definitely a great way for kids who are between 1 and 12 years old to burn off some energy. Plus, they’ll be having so much fun interacting with all of the activities that they won’t even realize that they’re actually learning through play, which is always an added bonus! Conveniently located in Midtown, the Memphis Pizza Cafe is a perfect family-friendly dining option. They offer cheese sticks, sandwiches, salads, calzones, and, of course, great pizza with fun toppings. Adults can unwind and enjoy a local craft brew with the pizza as well! Treat the kids to something sweet from La Michoacana! This local ice cream shop and paleteria serves up rich, creamy homemade ice cream and paletas, which are Mexican ice pops. With rotating flavors that include bubble gum, cookies and cream, and other childhood favorites, as well as more exotic flavors like pine nut for adults and adventurous kids, there’s something here for everyone. Plus, the fresh fruit paletas make for a healthier option, and the huge portions and reasonable prices mean that there’s no reason to not stop by. Experience the great outdoors without leaving Memphis!